Back from the dead. That's how it feels for Nan Vining a Pasadena homicide cop, a struggling single mother, and a woman determined to find the brutal madman who left her for dead a year ago. Now, in Dianne Emley's brilliant new thriller, Nan Vining must face the truth: her attacker is still out there and he's killed at least three other women. She has given a name to her unknown assailant: T. B. Mann The Bad Man. On the job, Nan breaks rules and steals evidence, building a case file based on the dead certainty that T. B. Mann is obsessed with women who wear uniforms or carry guns, that he hunts them and kills them, then adorns them with a pearl necklace. At the crime scene of her official assignment, the murder of an ex-con in a clown suit, Nan spots a graffiti tag and is sure, against all reason, that T. B. Mann was there, too. But she is fearful to share her suspicions. Further complicating matters is Nan's developing relationship with Detective Jim Kissick. In the grip of her secret obsession, she knows that opening her heart means losing control. Within this sprawling panorama T. B. Mann reemerges, bringing Nan to the sudden, horrifying realization that her killer has baited the perfect trap. Smart and gut-wrenching, deeply felt and passionate, The Deepest Cut startles and astounds from the first page to the last. 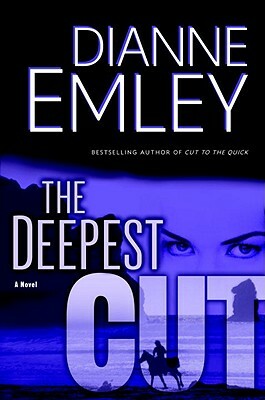 Dianne Emley gained critical acclaim for the previous books in the Nan Vining series, The First Cut, a "Los Angeles Times" bestseller, and Cut to the Quick. She lives in Pasadena, California, with her husband, Charlie.